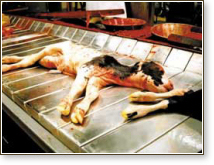 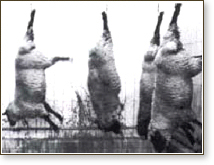 All cattle (beef, dairy, veal), goats, horses, pigs, poultry, rabbits, and sheep die on killing lines that operate at high speeds, and they are killed by high-turnover workers. 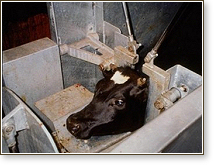 The stunning devices are poorly maintained and the staff rushed, which frequently results in animals shackled, hoisted, and killed while still conscious. 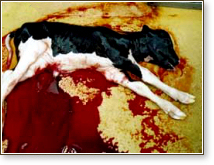 Anti-cruelty laws are ignored. 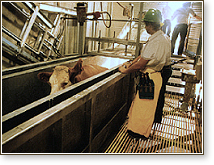 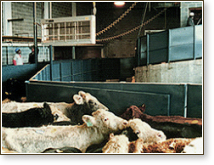 Even with humane legislation in place, the monitoring of staff, slaughter method, meat contamination, and food safety is inadequate. 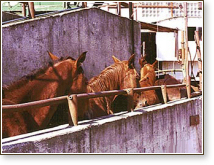 These photos of cattle (beef, dairy, and veal), horses, and sheep represent our callous and merciless handling and exploitation of some of the meekest species on our planet. 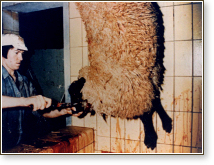 Chickens, ducks, geese, goats, rabbits, turkeys, and wild game are all factory farmed and heartlessly slaughtered.